Spring 1968: Returning Home To A Smoke-Filled City And Nation In Crisis NPR's Susan Stamberg remembers flying back from India in 1968 to a city and country that was in the middle of a nervous breakdown. 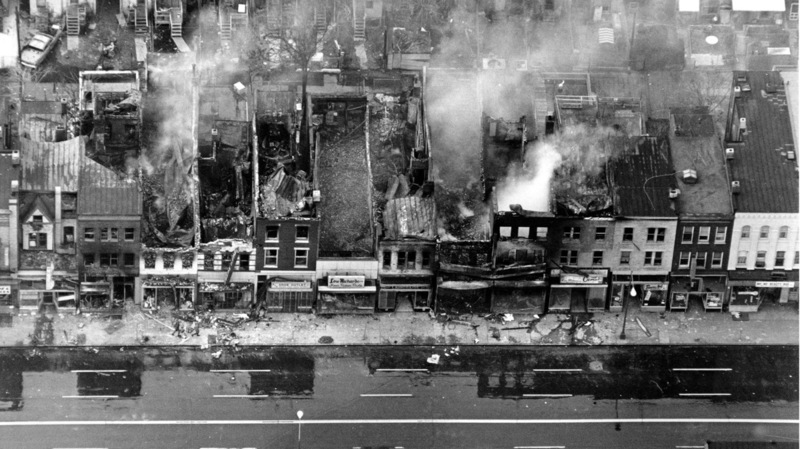 Fire-gutted buildings seen in northeast Washington, D.C. on April 5, 1968, the day after the assassination of Rev. Martin Luther King, Jr. The city was layered in smoke when our plane landed at Washington's National Airport in April 1968. Martin Luther King, Jr. had been assassinated a few days earlier, and agonized, enraged rioting broke out in several American cities. In Washington, D.C., buildings were burned, stores looted. There was a curfew. Thousands of federal and National Guard troops patrolled the streets. The Capitol and White House had Marine and Army guards. This pandemonium was our welcome home, after three years in India. My husband's job at USAID — the foreign aid agency that is part of the State Department — had taken us to New Delhi. I studied Hindi, and volunteered in a village. Home was another, far less exotic country. As we sat under a banana tree in our dusty Delhi garden reading two-week-old copies of Time and Newsweek magazine, I couldn't take their reports seriously. Exaggerated! Sensationalized! Major demonstrations against the war in Vietnam? Psychedelia and flower children in San Francisco? That wasn't the America we'd known. We were proper, educated, well-behaved children of the 1950s — obedient, polite, dedicated to Kennedy administration ideals, out to save the world and spread democracy. We carried those values to India, and felt proud, protected and patriotic in those Cold War years. 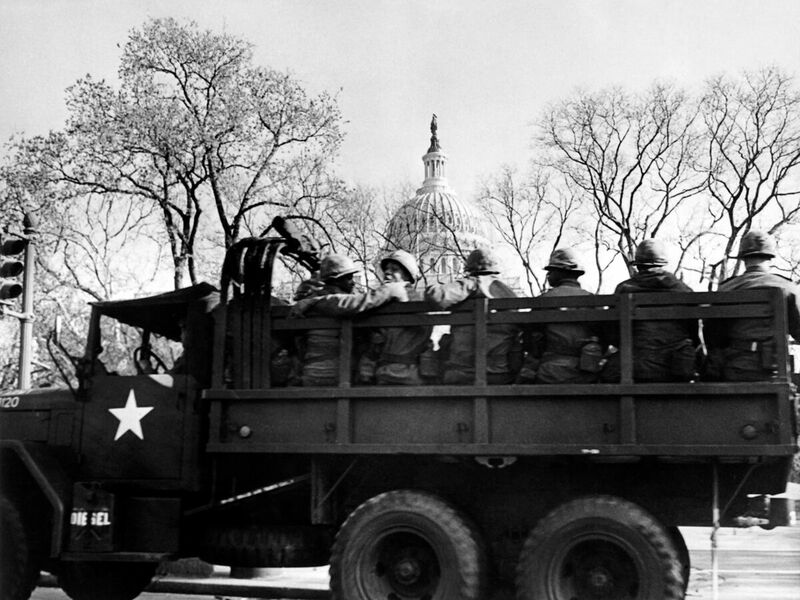 National guard troops patrol outside the Capitol in Washington, D.C. on April 5, 1968, one day after Rev. Martin Luther King Jr. was assassinated. When the Pan Am pilot flying us away from New Delhi announced that President Johnson would not run for re-election, the passengers burst into cheers. We were stunned. What was going on? Vietnam wasn't that far from India, but hatred of that war hadn't really hit us until then. On a stop-off in Bangkok, the airport was filled with exhausted U.S. troops, resting and recuperating from the fighting. We realized we were travelling into new, disorienting awakenings. Finally landing, the sight of our city, smoke-blanketed and troop-encircled, was a culture shock far greater than any we'd experienced in the totally foreign, impoverished South Asian capitol we'd called home for a while. Two months later, settling into a new apartment with a great bathroom view of the Washington monument, waiting for the Liftvan that would bring our furniture and batiks and brass elephants back from India, our phone rang in the middle of the night. Bobby Kennedy. Murdered in Los Angeles. Even for those who hadn't lived halfway around the world for the last three years, the spring of 1968 felt like a national nervous breakdown. For my generation, the certainties we'd grown up with were tottering. It was a new world - dangerous, unpredictable, unimagined. We weathered it, of course. Moved on to a tattered peacetime and administrations with different visions. But the scars of 1968 remain in the psyches of those who lived through it.